Drying apricots is a labor intensive process. First, ripe fruit must be removed from the packing belt and set aside for cutting. 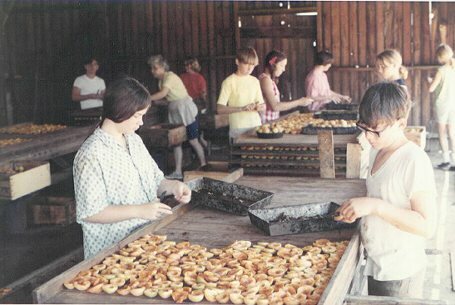 Many employees, most often school-aged kids, were employed to cut overripe apricots and lay them on drying trays. They were paid by the number of apricots they cut, which was measured by weighing the pits. Wolfe apricots dry in the sun. Mt Diablo is in the distance. Many kids spent their summers cutting cots. 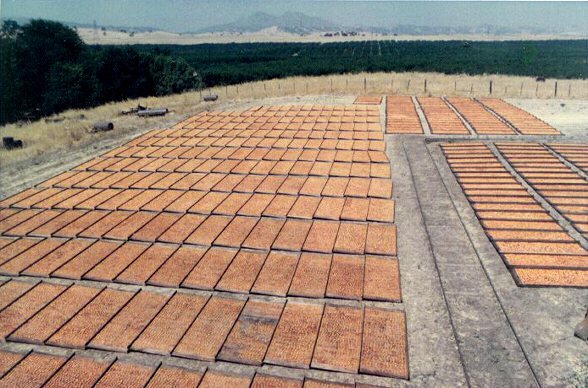 After the apricots were cut, the trays were placed in a building called a sulfur house. There, sulfur was burned to keep the dried apricots from turning a dark color. After sulfuring, the trays were laid in the sun for about 3-4 days. When completely dry, the dried apricots were scraped off the trays, weighed, and packaged.